Did I mention I was on a serious textured kick lately? I mean, seriously... I just cannot stop reaching for textures every time I go to do any mani I intend on wearing for more than a few hours. I am a BIG fan of the ease of texture polishes. Meaning you just need a base coat, one or two coats of a texture and you're done. They dry really quickly and, to me, always look AMAZING. 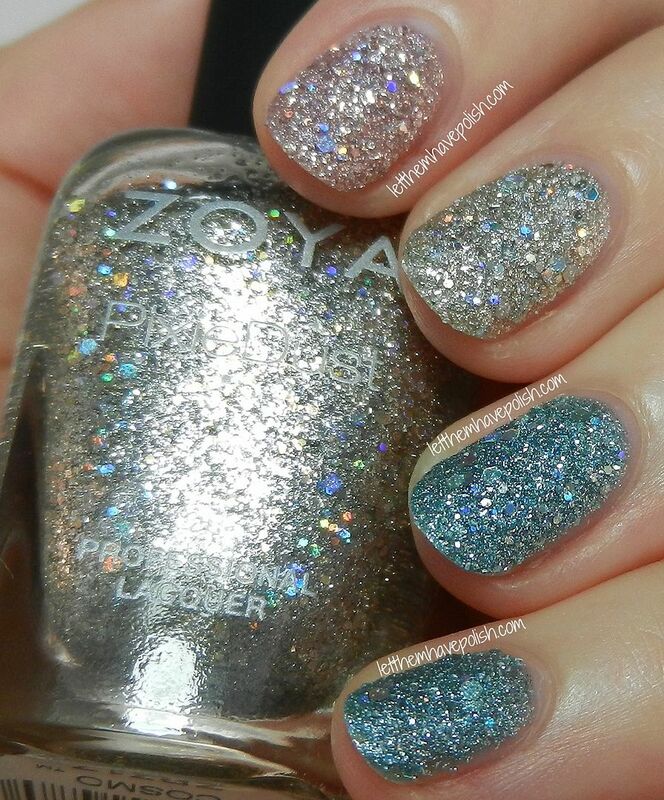 This past weekends mani was all about the beautiful Zoya Magical Pixies for Spring 2014. This Trio is made up of Three gorgeous sparkling textures. They all feature a strong holographic twinkle, and lots of chunky glitter. On my thumb and index nails I wore Zoya Lux. Lux is a soft, rose quartz micro sparkle texture base accented by prismatic rose hexes ranging from small to CHUNKY :D. Even though this color is soft and feminine it packs a huge sassy punch thanks to the super sparkly finish. On my middle nail I wore Zoya Cosmo. Cosmo is the bright Silver sister of Lux. She is basically the same concept, but in an insanely beautiful Diamond- Silver color. Last, but not least, is Zoya Vega which is the Sky Blue version of Lux and Cosmo. These three beauties have a very dense formula. They are very, VERY packed with sparkles. They really do resemble crushed precious stones. I used Two coats of each color. A light hand is best to ensure an even spread of the glitter all over the nail. Removal of these can, and probably will be a pain. For that reason I wore the OPI peel off base coat underneath. I am glad to say that these pretties wore like IRON for SEVEN days, and I was still able to peel them off when I was ready for a change. These are the sparkliest of all the PixiDusts that have been released, and some of my favorites. I love how chunky they are and how much they sparkle. I also loved the dense formula because I could definitely get away with one coat in days where I might be rushing. These retail for $10.00/ color. Did you pick any of these up? What are your thoughts on these sparklies? I am with you - I'm constantly choosing the textured polishes in my stash over anything else! I'm a mom of a 6-month old, so my hands and nails tend to take a beating. I find that my Pixie Dust polishes can take the abuse and look great for days! Loving Lux Lux and Cosmo Cosmo atm! Awww Yisss mother f-ing sparklies!!! ...Internet jokes aside, these are ideal candidates for the peel off base coats. The peel off base has renewed my love of glitters and takes away the headache of wearing sparkle heavy/grit heavy glitters! This is so sparkly and pretty! Nice combination. I SOOOO know where you are coming from. I no longer hesitate to pack on the sprkles! So pretty! I love love love sparkly nails. Love them combined! Very pretty :).